How Much Should a Book Cost? How much should a book cost? Some people get upset if a Kindle book costs more than $2.99. Some hardbacks cost $25.99. I’ve paid $100 for a text book that was smaller than most novels. I remember some romance novels Mom had with a price of 69¢. Today, those same books would bring about $6. I saw somewhere that the production cost of a hardback is only 50¢. The same source said the production of an e-book is $4.05. But e-books typically go for less than a hardback. Are publishers overcharging us for hardbacks? Are we paying too little for e-books? How can we figure this out. First, production and delivery costs shouldn’t matter to the consumer. There are a lot of people out there who think Kindle books should be priced very low because the publisher doesn’t have to pay to print them. In truth, printing is not the major drive on book pricing and there are plenty of costs for e-books that publishers must consider, but as a consumer, I have no reason to be concerned with that. The real question is, am I willing to pay that price? I’ve seen a lot of assisted self-publishing books priced at $20. I’ve bought a few of those, but it makes me hesitant. And yet, if there is a computer book I really want, I’ll pay the $45.95 asking price. It is about how much I want the book, not how much someone else had to pay to produce it. Second, publishers should be looking to maximize their profit. Publishers are in the business of making money, so their investors are happy and so they can publish more books. Consumers may prefer to get books free, but publishers are looking for ways to make as much money as they can. Aren’t we all that way? If our boss offers to give us more money, not many people would turn it down. But maximizing profit isn’t as easy as increasing the price of a book. The lowest sellers can go is one penny over the cost, if they want a profit. The highest they can go and make a profit isn’t as easy to figure out. There is a price at which the number of books sold will not be high enough to cover the cost of producing the books. 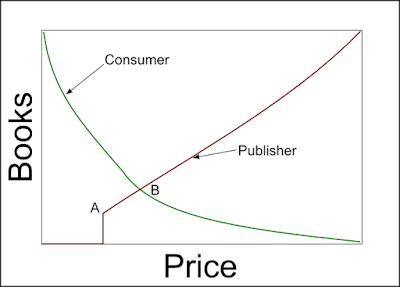 So publishers’ profits are also dependent on how much the consumer is willing to pay. In the drawing, A represents the point at which a publisher can first sell a book and make money. That could be as low as $1 and it could be as high as $100,000+. We’ll assume it is something like $5. The consumer line shows the willingness of the consumer to buy the book. There are some people who will “buy” a free book just because it is free, so we expect that the lower the price the more people are willing to buy it. As the price goes up, the number of books sold goes down. At point B, the number of books the consumers are willing to purchase crosses the line showing how many books the publisher is able to print for that price. That is the price at which the publisher will make the highest profit. 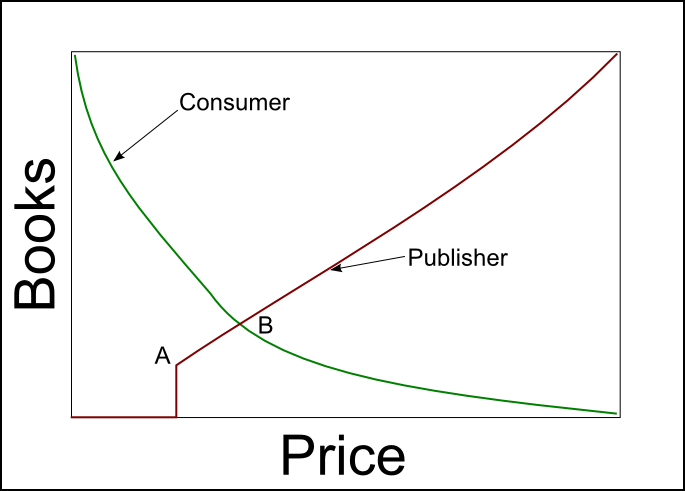 If the Consumer line were to cross the publisher line before point A, then the publisher will never make a profit, no matter what price he sets it at. On the other hand, through promotion activities, the publisher may be able to push the Consumer line to the right, resulting in an increase in profits.